Gold Star Ballroom offers one of the largest dance floors of any ballroom in Volusia County. Voted Best Dance Floor in the County. 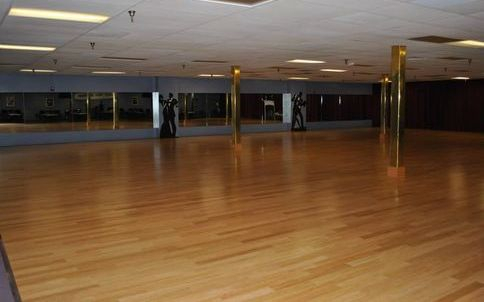 In addition to the main dance floor, a second dance floor is available for individual instruction, practice, or group classes. We are certain that you will appreciate the elegant atmosphere,an 8,000 square foot venue with a 4200 sq. ft. floating bamboo dance floor, great sound system, Wi-Fi, cool air-conditioning, snack bar, seating at tables and beautiful design where every detail has been carefully planned to ensure you have a wonderful dance experience. We also have ample well-lit parking lot for 200 and large restroom facilities. We are an Affiliate member of Shoes Salsa Dancing Store- visit them and mention our name when purchasing. We believe that Gold Star Ballrooms' friendly atmosphere and commitment to providing each individual with a quality dance experience will create an experience you will remember for years to come. Once you have stepped through the doors of Gold Star Ballroom, we are certain that you will agree it is "First-Class" Ballroom Dancing in Volusia County! Look around our website and if you have any comments or questions, please feel free to contact us by email at goldstarballroom@gmail.com or phone 386-315-4258. Check our weekly schedule for updates.